1 A None No Power Seat 1 A is a standard Business Class seat located at a bulkhead that transforms into a fully flat bed. There is no floor storage for this seat during take-off and landing. 1 B None No Power Seat 1 B is a standard Business Class seat located at a bulkhead that transforms into a fully flat bed. The proximity to the galley area might be bothersome. There is no floor storage for this seat during take-off and landing. 1 D None No Power Seat 1 D is a standard Business Class seat located at a bulkhead that transforms into a fully flat bed. There is no floor storage for this seat during take-off and landing. 1 K None No Power Seat 1 K is a standard Business Class seat located at a bulkhead that transforms into a fully flat bed. The proximity to the galley area might be bothersome. There is no floor storage for this seat during take-off and landing. 1 L None No Power Seat 1 L is a standard Business Class seat located at a bulkhead that transforms into a fully flat bed. There is no floor storage for this seat during take-off and landing. 16 A None No Power Seat 16 A is missing a window and may have restricted legroom due to the position of the bulkhead. The close proximity to the lavatories and galley may be bothersome. The tray table is in the armrest, making the armrest immovable and slightly reducing seat width. There is no floor storage for this seat during take-off and landing. 16 B None No Power Seat 16 B is missing a window and may have restricted legroom due to the position of the bulkhead. The close proximity to the lavatories and galley may be bothersome. The tray table is in the armrest, making the armrest immovable and slightly reducing seat width. There is no floor storage for this seat during take-off and landing. 16 D None No Power Seat 16 D is missing a window and may have restricted legroom due to the position of the bulkhead. The close proximity to the lavatories and galley may be bothersome. The tray table is in the armrest, making the armrest immovable and slightly reducing seat width. There is no floor storage for this seat during take-off and landing. 16 E None No Power Seat 16 E is missing a window and may have restricted legroom due to the position of the bulkhead. The close proximity to the lavatories and galley may be bothersome. The tray table is in the armrest, making the armrest immovable and slightly reducing seat width. There is no floor storage for this seat during take-off and landing. 16 F None No Power Seat 16 F is missing a window and may have restricted legroom due to the position of the bulkhead. The close proximity to the lavatories and galley may be bothersome. The tray table is in the armrest, making the armrest immovable and slightly reducing seat width. There is no floor storage for this seat during take-off and landing. 16 K None No Power Seat 16 K is missing a window and may have restricted legroom due to the position of the bulkhead. The close proximity to the lavatories and galley may be bothersome. The tray table is in the armrest, making the armrest immovable and slightly reducing seat width. There is no floor storage for this seat during take-off and landing. 16 L None No Power Seat 16 L is missing a window and may have restricted legroom due to the position of the bulkhead. The close proximity to the lavatories and galley may be bothersome. The tray table is in the armrest, making the armrest immovable and slightly reducing seat width. There is no floor storage for this seat during take-off and landing. 17 A None No Power Seat 17 A is a standard Economy Plus seat that has a misaligned window. 18 A None No Power Seat 18 A is a standard Economy Plus seat that has a misaligned window. 27 A None No Power Seat 27 A is a standard Economy Class seat in the last row of the section. This seat has limited recline and the close proximity to the lavatories may be bothersome. 27 B None No Power Seat 27 B is a standard Economy Class seat in the last row of the section. This seat has limited recline and the close proximity to the lavatories may be bothersome. 27 D None No Power Seat 27 D is a standard Economy Class seat in the last row of the section. This seat has limited recline and the close proximity to the lavatories may be bothersome. 27 E None No Power Seat 27 E is a standard Economy Class seat in the last row of the section. This seat has limited recline and the close proximity to the lavatories may be bothersome. 27 F None No Power Seat 27 F is a standard Economy Class seat in the last row of the section. This seat has limited recline and the close proximity to the lavatories may be bothersome. 27 K None No Power Seat 27 K is a standard Economy Class seat in the last row of the section. This seat has limited recline and the close proximity to the lavatories may be bothersome. 27 L None No Power Seat 27 L is a standard Economy Class seat in the last row of the section. This seat has limited recline and the close proximity to the lavatories may be bothersome. 28 A None No Power Seat 28 A is an Economy Plus Exit Row seat, however the close proximity to the lavatories may be bothersome. The exit door may protrude into your space, which can be bothersome. The tray table is in the armrest, making the armrest immovable and slightly reducing seat width. There is no floor storage for this seat during take-off and landing. 28 B None No Power Seat 28 B is an Economy Plus Exit Row seat, however the close proximity to the lavatories may be bothersome. The tray table is in the armrest, making the armrest immovable and slightly reducing seat width. There is no floor storage for this seat during take-off and landing. 28 D None No Power Seat 28 D is an Economy Plus Exit Row seat, however the close proximity to the lavatories may be bothersome. The tray table is in the armrest, making the armrest immovable and slightly reducing seat width. There is no floor storage for this seat during take-off and landing. 28 E None No Power Seat 28 E is an Economy Plus Exit Row seat, however the close proximity to the lavatories may be bothersome. The tray table is in the armrest, making the armrest immovable and slightly reducing seat width. There is no floor storage for this seat during take-off and landing. 28 F None No Power Seat 28 F is an Economy Plus Exit Row seat, however the close proximity to the lavatories may be bothersome. The tray table is in the armrest, making the armrest immovable and slightly reducing seat width. There is no floor storage for this seat during take-off and landing. 28 K None No Power Seat 28 K is an Economy Plus Exit Row seat, however the close proximity to the lavatories may be bothersome. The tray table is in the armrest, making the armrest immovable and slightly reducing seat width. There is no floor storage for this seat during take-off and landing. 28 L None No Power Seat 28 L is an Economy Plus Exit Row seat, however the close proximity to the lavatories may be bothersome. The exit door may protrude into your space, which can be bothersome. The tray table is in the armrest, making the armrest immovable and slightly reducing seat width. There is no floor storage for this seat during take-off and landing. 33 A None No Power Seat 33 A is a standard Economy Class seat that has a misaligned window. 33 L None No Power Seat 33 L is a standard Economy Class seat that has a misaligned window. 44 A None No Power Seat 44 A is in the last row of the plane and may have limited recline. This seat is narrower than a standard Economy Class seat due to the curvature at the tail of the plane. The close proximity to the galleys may be bothersome. 44 B None No Power Seat 44 B is in the last row of the plane and may have limited recline. This seat is narrower than a standard Economy Class seat due to the curvature at the tail of the plane. The close proximity to the galleys may be bothersome. 44 D None No Power Seat 44 D is in the last row of the plane and may have limited recline. The proximity to the galley may be bothersome. 44 E None No Power Seat 44 E is in the last row of the plane and may have limited recline. The proximity to the galley may be bothersome. 44 F None No Power Seat 44 F is in the last row of the plane and may have limited recline. The proximity to the galley may be bothersome. 44 K None No Power Seat 44 K is in the last row of the plane and may have limited recline. This seat is narrower than a standard Economy Class seat due to the curvature at the tail of the plane. The close proximity to the galleys may be bothersome. 44 L None No Power Seat 44 L is in the last row of the plane and may have limited recline. This seat is narrower than a standard Economy Class seat due to the curvature at the tail of the plane. The close proximity to the galleys may be bothersome. 8 B None No Power Seat 8 B is a standard Business Class seat that transforms into a fully flat bed. The close proximity to the galley and lavatory area behind might be bothersome. 8 K None No Power Seat 8 K is a standard Business Class seat that transforms into a fully flat bed. The close proximity to the galley and lavatory area behind might be bothersome. 8 L None No Power Seat 8 L is a standard Business Class seat that transforms into a fully flat bed. The close proximity to the galley and lavatory area behind might be bothersome. It also has a misaligned window. This seat map reflects United's 767-400 international configuration, including 39 Polaris flat bed seats, 70 Economy Plus seats, and 133 Economy seats. I found this standard Economy Plus seat on the long haul EWR-HLN to be perfectly fine. Good pitch which provides sufficient legroom (though admittedly I'm 5'5" 140 lbs). Just as importantly, you don't feel claustrophobic when the seat in front of you reclines and you don't feel sorry for the passenger behind you when you recline yours. This is an updated aircraft with little headrest wings and a seatback screen in front with lots of movie choices. USB outlet on the screen in front and power outlet below the seat. Make sure you bring food because the purchase options are quite limited for an 11 hour flight. I enjoyed the flight from Rome to Newark. The seat was comfortable and I had enough space to work. Service was good...except for loud argument between to flight attendants. It was a bit embarrassing to witness. And the announcement system was on so the whole plane here it. The plane is definitely old but this seat was fine. Flight from EWR To ROM was very diaappointing. Flight was held for connecting passangers for about 40 min. (UA isn't paying attention to airport transit time in EWR.) As others have noted the flight attendants seem to ignore this section of the plane. And the seat was small, there was no place to put laptops or other things needed while flying. Very cramped. I would not fly this seat again. We were assigned 18 A-B. Wonderful seat, lots of legroom, decent seat width for Economy cabin. (Note that plane was 767-4 that day). 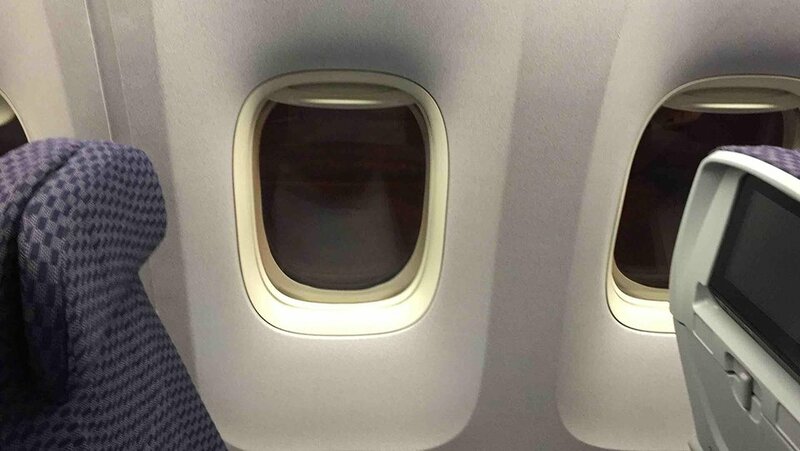 Only 1/2 window in 18A (one window between 18 and back of 17 was a blank panel, no vitrine. We moved back to row 19 .. same comfort level plus excellent visibility out due to both windows (really 1-1/2) being present and unobstructed. These seats don't have the problem of the exit door bumping into your space, and no window. Because they unusually have a great aligned window as well as the door isn't coming it AT ALL, there's no slide raft in these doors. These 2 seats should be at least Green/Yello if not green. Just flew this flight from Paris to Chicago. The seat had good leg room and was adequately comfortable for 61 man. United has addressed the tiny screen entertainment issue by offering a great wifi option. Just download the United app onto your device prior to the flight and you can view great options on your own device during the flight. Flight crew was very kind and professional. One of the worst possible seats in business class. United's "Polaris" is just a bunch of jazzy, flashy marketing lingo for "We're rebranding these crapy planes - pay no attention to the man behind the curtain". Anyway, 5D is sort of a service purgatory. The forward attendants think the rear attendant will address needs and vice versa. I had this seat twice (I selected it - thought it would be good) on a recent trip to and from Europe. Same thing happened on both transoceanic flights. The forward crew left me for the rear crew; the rear crew left me for the forward crew. By the time I got my entree, the forward crew was coming down the aisles with the damned dessert cart. So not only did I get overlooked, by the time they did get me, everyone else was done. I had to navigate out from under the mound of wires, cords, and connections and contort myself out of partial recline on both flights to request water so I could swallow that crap they called dinner. United uses this seat for crew, and weeks after reserving 6D and receiving multiple confirmation emails, United booted me from 6D with no notice. They were not able to offer any explanation over the phone, nor were they able to provide another seat in row D.
Seat 5A in BusinessFirst IAD-BCN. This is a pre-merger Continental plane. BusinessFirst seat very comfortable (I am 179cm). I find this an excellent plane and much superior to the 777 in terms of cabin layout, sad to see it is discontinued by Boeing. Only thing they have to address is this loud DONG sound when the captain toggles the fasten seat belt sign, it is loud enough to wake you up. Plenty of storage space, and good service. Food was too much (both quantity and duration), if you do the full menu you only have like 3 hours left to sleep, so my advice is to consider the express dining option if you want to make the most of your flat bed seat. Good seat. Lies almost flat, and is comfortable. This with 5L would be good for a couple. I am 6' 5" and when the seat was fully extended, could not lie straight flat. My guess is that persons 6' 2" or less will be able to lie straight flat. Irregardless, excellent seat. 1st class service was good for domestic and long flight. I find these 764 planes very comfortable in all classes. Unless you're very tall, I don't see much advantage in upgrading to Economy Plus (I'm 180cm and was fine in both normal economy and economy plus). Will be trying BusinessFirst soon on this plane. Overall this 767-400 has a far superior configuration over the 777 on United, and also the cabin crew seems more fresh and responsive (on the 777 they tend to disappear into the crew rest area, which the 767 doesn't have). MAD-EWR, further better than expected as the reviews made me think the flight would be horrible. Good legroom, at the same level as the Arab carriers. Not worthy to pay for economy plus (at least for seats 33 A and B). Good AVOD with personal screen. Food is not the best, but it is ok taking into account good value for money. I will definitely reccomend this flight. The extra legroom made it worth the upcharge for Economy Plus for this international flight. Galley noise and light was noticeable, advise bringing ear plugs & eye mask. Configuration of bathrooms and galleys makes it impossible to stand up and stretch except in the aisle. Good food and good entertainment screen options. These are often old Continental birds with their superior seating relative to other UA aircraft with (alternating) backward facing and far narrower business class seat configurations. However, the footwell is not large enough for sleeping on one's side unless you are shorter than 5'8". 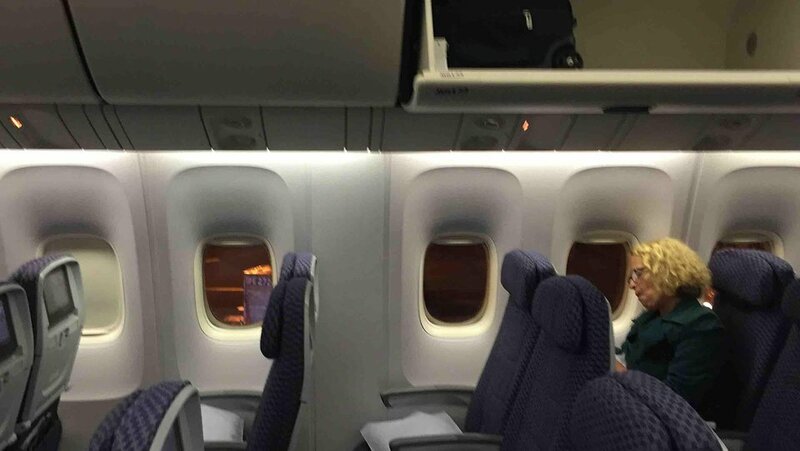 There is some seat-by-seat variation: Footwells are uniformly smaller in the middle row (seat D) and window seats near the front of the business first cabins (seats A and L). This row has loudspeakers over both aisles, thus,when making announcements, the seats under those speakers get a louder than normal blast. Also the ratio of restrooms to seats for business first vs tourist is asinine. Physiological needs are the same whether in BF or T class. united BusinessFirst seats are very comfortable and lie flat. However, 1B is very close to the forward galley, which is also the hang out for all the flight attendants. So, consider yourself part of the flight crew in this seat! Legroom is very limited throughout economy. If the person in front of you reclines, the video screen is less than six inches from your face. UA's 767 long haul business class has aisles on both sides, making for easy access/egress and seems ideal for single business class PAX Also 2 overhead storage bins. The downside, however is that the footwell is extremely narrow, making it almost impossible for tall passengers to sleep with both feet extended. I'm over 6' and always struggle in a "D" seat. Excellent Business class seats. Very comfortable. I was able to sleep all night. Great food and wines. Good service. I'm 6'8" with 38" inseam and had a pleasant inch of legroom space. Unfortunately the metal guard under the seat in front of me was too close to the left leg so I didn't have any room for my left foot. The aisle seats across from me 16F through 27F did not have this problem. On the left side of the plane the problem is reversed 16B through 27B have no room for your right foot. United's 767-400ER economy seats are far more comfortable than those on their older aircraft, such as their 747s and 757s. The entertainment on this aircraft features many, many more shows and movies than other aircraft do. Their seat pitch is still 31 inches, but because of their thinner seat design - which actually felt more comfortable than their thicker seat design - there was still the same amount of legroom. The only issue I had with the seat design was the fact that the entertainment screen didn't tilt up or down. If you're too short or tall, that could be an issue - especially if you're tall and the person in front of you reclines. Despite that, the screen had a nice, elegant design, with illuminated chargers. 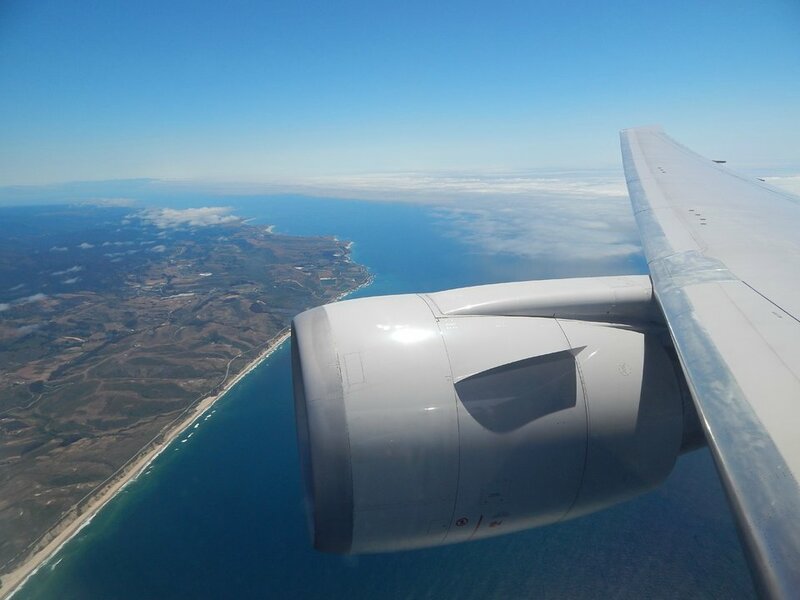 Despite their 767-400ER being an aircraft used on international routes, they also fly it between Honolulu, Hawaii, and Newark, New Jersey on flights 14 and 15. United doesn't offer meal service on flights to and from Hawaii, which is lame, but they do sell snack boxes, which, personally, I think are overpriced and not nearly filling enough for a 10 hour flight. Make sure to bring something to eat if you're flying to Hawaii! Overall, United's 767-400ER is a big improvement from most of their fleet - I mean, their 747 doesn't even have seat-back entertainment in economy! The cabin on the 767-400ER shares the 777's and 787's cabin in the fact that it has nice, rounded overhead bins with more space for baggage, but it doesn't have LED lighting, which isn't a big deal. Also, the cabin feels bigger and more spacious because of it's design. I would definitely recommend this aircraft over any of United's other aircraft, except for their 787s. Even though this plane is more than ten years old, it still feels quite new. 3B was an extremely comfortable seat, and the meal served in BusinessFirst was the best meal I have ever had on an airplane. UA's enhanced meal service is actually making a difference. On the downside, having only two restrooms for 39 BusinessFirst passengers and the flight crew means almost always having to wait to use the restroom. This seat is perfect for a daytime flight. I agree that, overnight, the location near the lights and noise of the restrooms could be bothersome. In daytime though, the generous legroom of the exit row and a good view out the window make this seat ideal. Best seat when flying solo on international flights. Last two rows of the businessfirst cabin are served by the middle galley - the service is much faster and more personal. Seat is also noisy and cold due to the proximity of emergency exit. We had difficulty hearing the sound for the in-flight movie. Generous amount of leg room but passengers using the lavatory would wait in the space. Would not recommend. Basssinets are wall-mountable in four positions across row 16 at the front of coach. There are no bassinet positions in BusinessFirst. 1AB and 1KL have larger footwells than other seats in BusinessFirst. All seats of row 1 have a "counter" above the IFE screens, useful for additional storage during flight. I disagree with the person who says the lie-flat seating makes it harder to get from the window seat to the aisle. In the prior configuration the seat in front could/would be reclined, creating an overlap of the head of the seat in front over the feet of the aisle seat next to you. My body doesn't fold that way to climb out. In the current config, there is a small spot to step between the seats, and there is no possible overlap because of the shell back of the seats. It's still not easy, but it's not impossible. Regarding the location of the toilets, a flight attendant told me this was an older aircraft owned by a previous airline, and that it goes back to the days when full paying First Class passengers didn't want a "smelly" toilet in their section, so they put the toilets back in Coach, then told Coach passengers not to use them! Doesn't make any sense to me. When I'm paying a full refundable fare in Business or FC, I want close access to a toilet. I was dismayed to see that united ropes off the lavatories at the front of the "economy Plus" sections. They are reserved for first class, but no tip-off to this fact when you pay extra for economy plus seats. 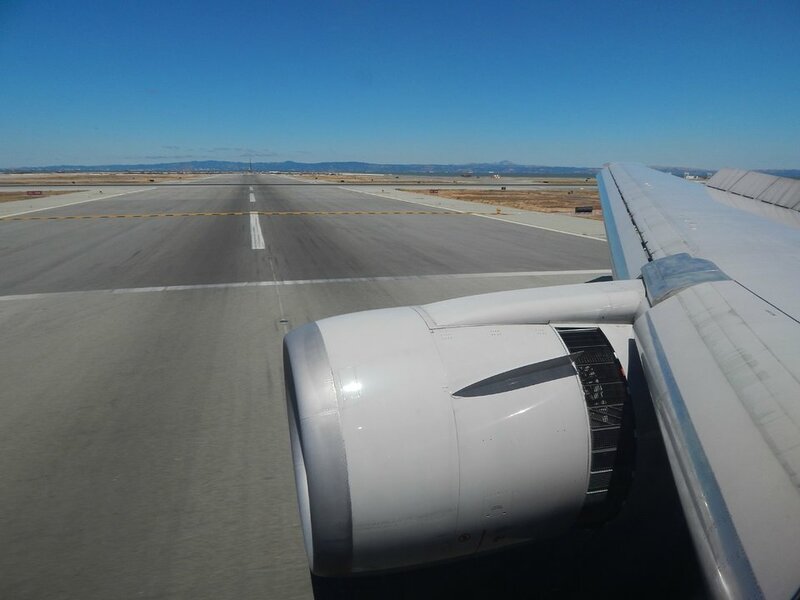 You are expected to walk all the way to the rear of the plane, when unused lavs are right in front of you!! United has done a disservice to its business class customers by the recent modificatios to its fleet. It has inserted a couple extra rows of seats and converted all seats to "lay flat". Unfortunately these changes have turned the window seats into high flying prisons! It is nearly impossible to exit these seats when the aisle seats are fully reclined. On long flights such as return from Amsterdam or non stop Houston-Tokyo the prison-seat can become a burden. You will notice that aisle seats are in higher demand and disappear early. Pity anyone trapped for 10-12 hours on a window seat. Toilet may seem so close and yet so far away. 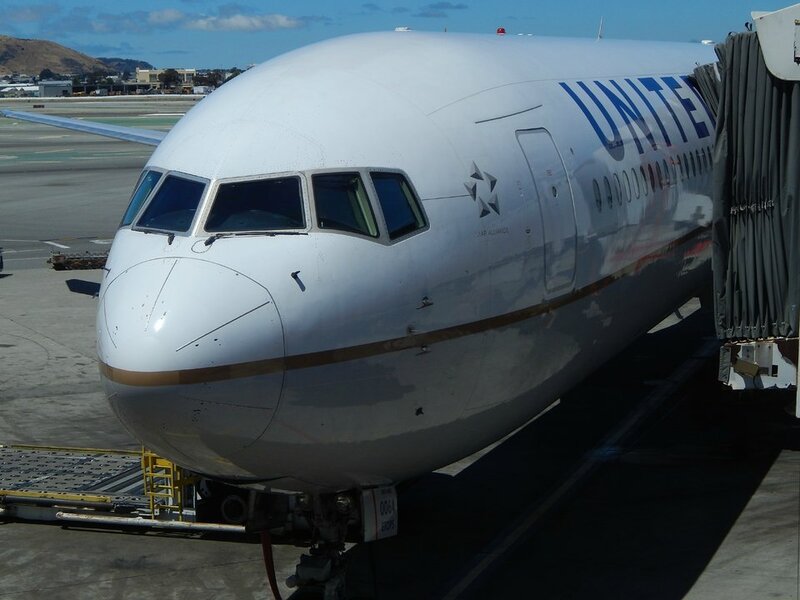 United flies 1 versions of Boeing 767-400ER.